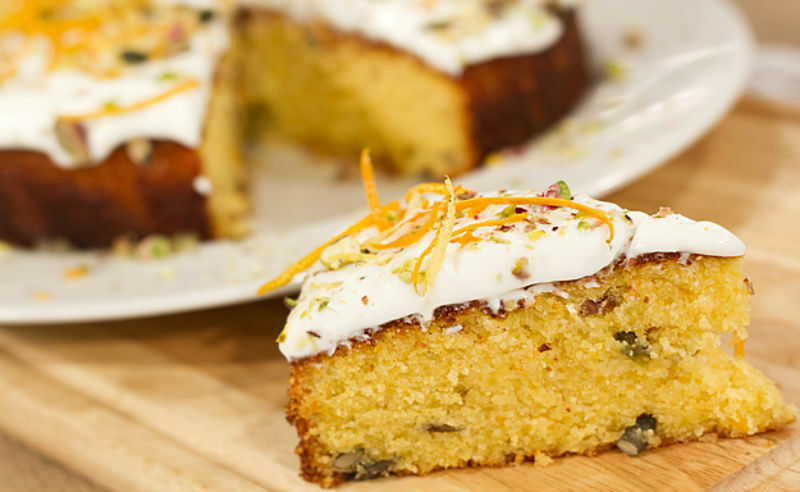 This cake has a sweet citrus flavour and is dense and moist. Try it out with a cup of coffee on a cold afternoon. 1. Line a 20cm spring bottomed tin with baking paper and put aside. 2. Start by beating together the butter and sugar till light. Mix in the 100g pistachios, polenta, ground almonds and baking powder. 3. Next, mix in the eggs one at a time, followed by the 250g Greek yogurt, citrus juice and zest. 4. Spoon into the prepared baking tin, level out and bake in a hot oven at 200`C for approximately 50 minutes. 5. Remove from the oven and allow to cool down completely. 6. To serve, spread over the remaining Greek yogurt and toss over the pistachios and orange zest.